Hey, who’s going into NYC this weekend to see the Macy’s fireworks show? It’s the world’s largest Independence Day fireworks display, with 40,000 fireworks synchronized to a 25-minute musical score! We’re gonna wait a few years before exposing The Girl to that kind of “revelry,” but if anyone goes, tell me about it! 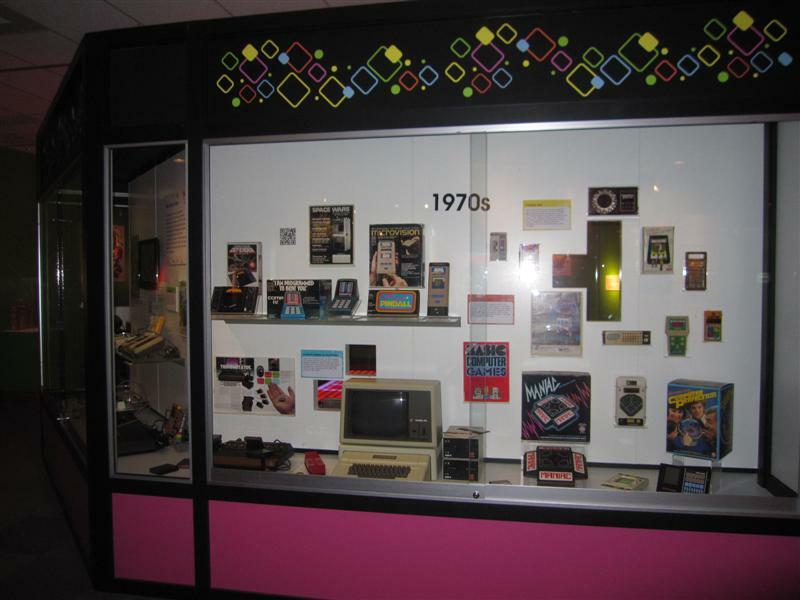 After we planned our May road trip to Rochester for the Lilac Festival, we read about the International Center for the History of Electronic Games (ICHEG), which has one of the world’s largest collections of electronic games, as well as the world’s largest public collection of video games. The Boy couldn’t get there fast enough. Then again, neither could Matt. Meet the Go BIG version of the apple and tree. I wouldn’t make a six hour drive just for an exhibit of electronic games. The ICHEG, however, is part of The Strong, a non-profit institution dedicated to the study of play. Another part of the facility is the National Museum of Play, the world’s second largest children’s museum. So, while The Boy (and his father) got all worked up and frothy in anticipation of seeing all those bits and bytes, I was reassured that The Girl would be happy with all the toys and games at the museum. The actual collection is expansive, and not all of it is on view. 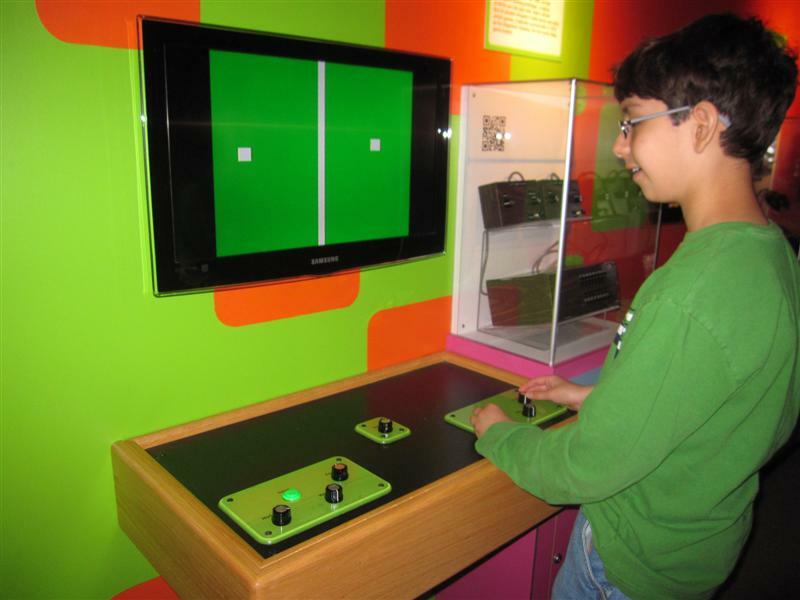 What you do see is the permanent exhibit, eGame Revolution, within the National Museum of Play. Our first stop was to pay homage to The Brown Box, the 1968 precursor to Pong invented by Ralph Baer. The Boy and I stepped up, manned our paddles, and…waited…for…the…ball…to cross the screen. Remember when Pong was new and unbelievable and everyone wanted it? Now I can only think about how much time we wasted waiting for the ball to cross that dang screen! In the arcade section, there are more than two dozen historic video games, like Galaga, Centipede, Pole Position, and of course, Pac-Man. They are operational, but you need to purchase tokens to play them. 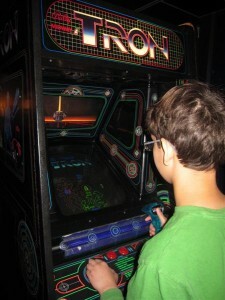 The Boy felt a connection to TRON, since we recently saw TRON Legacy. The connection to low-tech didn’t last long though, as he spotted the Wii Guitar Hero, and classic console and PC games like Sonic the Hedgehog and Super Mario 64. (Ten points to the first person who can tell me what Mario’s original name was he first appeared in 1981!) 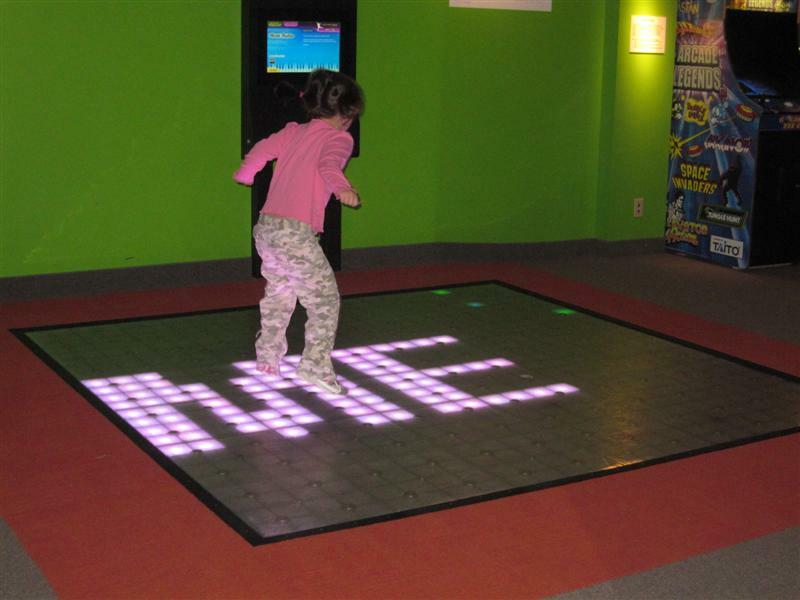 The Girl spent most of her time on the pixilated wall resembling a giant Light Bright, and the electronic dance floor. I was drawn to the display cases, which were separated by decade. I will tell you my favorite section was the 1970’s, and you can draw your own conclusions. There was my Simon toy from 1978! And the Atari console complete with the brown, faux wood grain front panel and tethered joysticks! Ahhh, memories. The collection also includes notebooks from prodigious game designers. I was intrigued by these cryptic notes and diagrams, and amazed at how these two dimensional drawings evolved into multicolor, multidimensional video. The collection includes the notebooks of Will Wright, who created SimCity 2000 and its variations. This exhibit simultaneously thrilled the kids (for all the hands-on gaming), and us grown-ups (seeing our childhood playthings). We walked down memory lane, while the kids bounced from game to game like pinballs. Speaking of pinball, well, there’s that, too! The ICHEG opened in 2009 to collect, study, and interpret video and other electronic games. 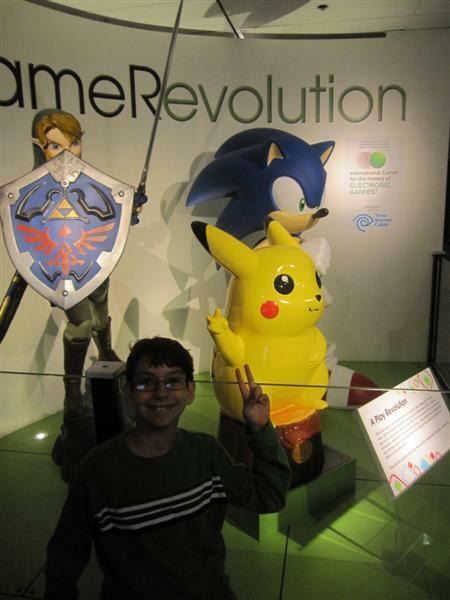 The eGame Revolution exhibit opened in 2010, and is a permanent exhibit within the National Museum of Play. The ICHEG collection is comprehensive, and vast. 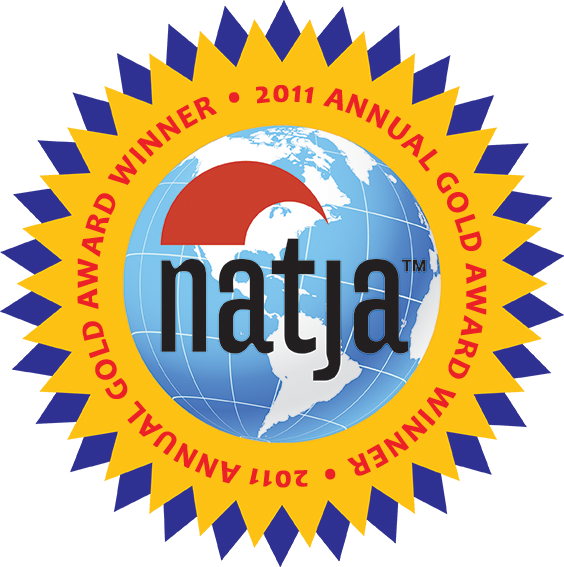 It includes more than 17,000 individual video game titles from all over the world. The arcade collection includes 120 arcade game “cabinets,” which are rotated between the public exhibit and storage. The collection also includes more than 200 handheld games, including the very first — Mattel Electronic’s Auto Race. How much you love this exhibit will depend on how many pocket protectors you’ve worn out in your lifetime. The geek in me loved it! From the kids’ perspective, the entire museum was a HUGE hit. Does this mean that my original Nintendo hand-held games are classics and worth something (Keep in mind that I am talking about cash. Nostalgia-based value need not apply.)? The video games collection looks like the sort of place some of my friends would go to AND NEVER LEAVE…! I genuinely appreciated this knowledge on art work and I’m just frequently researching for unique concepts like these. I intend to learn more through your blog site and look ahead to observing alot more of your art.